If you want to reset your password because you feel your old password and email have been compromised, you will need to create a new wallet and move your funds there. Resetting your password and email does not invalidate the email link. Your old email backup link will still work with the old password. Note: The email backup link is only applicable to wallets downloaded before version 19.2.1. If you forgot your password, you'll need to restore from your 12-word phrase to access your wallet. If you want to change your password, you need to log into Exodus with your current password. Open Exodus and enter your password. For your security, when Exodus restarts type your old password again. . The password and backup section will now be reset. 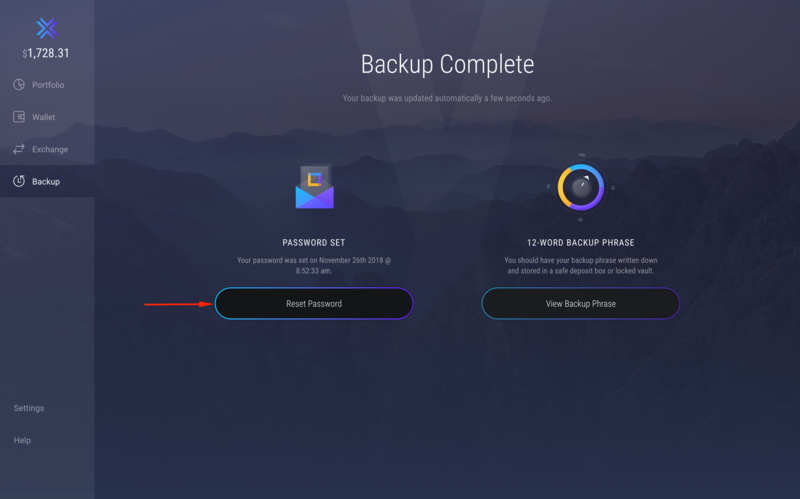 You will then be taken through the backup process.